Iaido (ee-eye-doe), a derivative of Japanese Kenjutsu (swordsmanship techniques), is the study of drawing the sword, cutting, and returning it to its scabbard, all with a minimum of exertion. 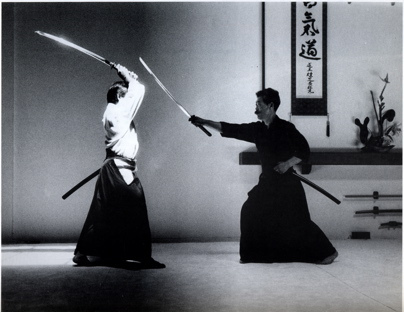 The essence of iaido, a non-combative discipline practiced for an individual's spiritual cultivation, is much different than its forerunner, Iaijutsu. Iaijutsu is also a sword-drawing art practiced with combative applications being stressed during training. Iaido is practiced today as an aid to self-discipline, improved coordination, and for the sake of posterity. In most styles of iaido the actual cutting techniques are valid, but the practice of iai for defense or war is no longer necessary in modern times. Training to deal with a surprise attack, with a minimum of exertion while defending oneself, however, can easily be seen to be a worthwile pursuit for the sake of day-to-day dealings with others. With iaido the physical and mental benefits are available to all practitioners, regardless of that person's martial arts background, if any. The style of iaido I was taught is called Mugai-ryu, by the late Soke Shogo Kuniba of the Seishin Kai (Seishin Kai Martial Arts, Inc. in the USA and Seishin Kai Karate Union in Japan). Mugai-ryu was founded in 1695 by Tsuji Getten Sakemochi (1650-1729). Tsuji, the son of a farmer, began his experience with swordsmanship as a disciple of kenjutsu at the age of thirteen. Mugai-ryu was a result of his more than thirty years of constant training.